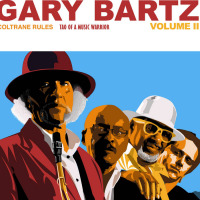 Gary Bartz has been known to many as a trail blazer in the music business from the moment he started playing with Art Blakey at his father’s jazz club in his hometown of Baltimore, MD to his own music throughout the 57 years as a professional musician. As if his Grammy Award© with McCoy Tyner in 2005 (‘Illuminations’) wasn’t enough to carve out a place for Bartz in the jazz genre, he has broken the mold with more than 40 solo albums and over 200 as a guest artist. With the splash of his New York debut solidly behind him, Bartz soon joined Art Blakey's Jazz Messengers. According to the story, Gary's parents owned a club in Baltimore, the North End Lounge. When his father hired Blakey for a gig, Gary grabbed the opportunity to fill a sax player vacancy in the band. After his performance that night, the young Bartz was officially hired to join the Jazz Messengers; in 1965, he would make his recording debut on Blakey's ‘Soulfinger’ album. From 1962-64, Gary joined Charles Mingus' Workshop and began practicing regularly with fellow members of the horn section, including Eric Dolphy. In 1968, Bartz began an association with McCoy Tyner, which included participating in Tyner's classic ‘Expansions and Extentions’ albums. Work with McCoy proved especially significant for Bartz because of the bandleader's strong connection to John Coltrane — who Gary succinctly cites as a profound influence. Bartz received a call from Miles Davis in 1970; work with the legendary horn player marked Gary's first experience playing electric music. It also reaffirmed his yen for an even stronger connection to Coltrane. In addition to working with Miles in the early '70s - including playing the historic Isle of Wight Festival in August, 1970 - Bartz was busy fronting his own NTU Troop ensemble. The group got its name from the Bantu language: NTU means unity in all things, time and space, living and dead, seen and unseen.Outside the Troop, Bartz had been recording as a group leader since 1968, and continued to do so throughout the '70s, during which time he released such acclaimed albums as, ‘Another Earth’, ‘Home’, ‘Music Is My Sanctuary’ and ‘Love Affair’, by the late '70s, he was doing studio work in Los Angeles with Norman Connors and Phyllis Hyman. In 1988, after a nine-year break between solo releases, Bartz began recording what music columnist Gene Kalbacher described as Vital ear-opening sides, on such albums as ‘Monsoon’, ‘West 42nd Street’, ‘There Goes The Neighborhood’, and ‘Shadows’. Bartz followed those impressive works in 1995 with the release of his debut Atlantic album ‘The Red and Orange Poems’ a self-described musical mystery novel and just one of Gary's brilliantly conceived concept albums. Back when Bartz masterminded the much-touted ‘I’ve Known Rivers’ album, based on the poetry of Langston Hughes, his concepts would be twenty years ahead of those held by some of today's jazz/hip hop and acid jazz combos. So it continues with ‘The Blues Chronicles: Tales of Life’ A testimonial to a steadfast belief in the power of music to soothe, challenge, spark a crowd to full freak, or move one person to think. It adds up to a shoe box full of musical snapshots from a life lived and played with passion and stirred - with both joy and sadness - by the blues. Gary's release ‘Live at the Jazz Standard Volume 1 – Soulstice’ is the first of a series of recordings documenting his legendary, non-stop style, live performances. This initial release on his own OYO label bares testimony to Gary's continuing growth as a composer, group leader, and master of both the alto and soprano saxophones. A quartet session recorded in 1998, was followed by ‘Live at the Jazz Standard, Volume 2’ released in 2000, which features Gary's exciting Sextet. His follow up release ‘Soprano Stories’ Gary exclusively performed on the soprano saxophone in a studio quartet setting. His follow up album to the highly acclaimed Volume I of the Coltrane Files, Toa Of A Music Warrior, will be released in early 2015 along with his album honoring Woody Shaw entitled ‘Two MF’s’. Gary Bartz continues taken his rightful place in the pantheon of jazz greats and has his sight is set on releasing more music on his label OYO Records. All About Jazz musician pages are maintained by musicians, publicists and trusted members like you. Interested? 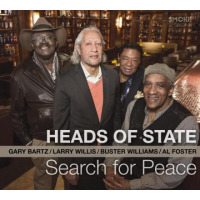 Tell us why you would like to improve the Gary Bartz musician page.